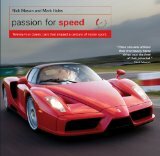 “Passion For Speed” puts you behind the wheel of the greatest ever sports and racing cars. Nick Mason of Pink Floyd has been acquiring and racing cars for nearly 40 years. With test driver Mark Hales, he has given the pick of his cars a no-holds-barred workout at Silverstone, Donington and Anglesey to find out how they compare under pressure. Feel the force of a Le Mans Porsche. Relish the challenge of a 1920s Bugatti. Savour the elegant performance of the Ferrari 250GTO. With specially commissioned photographs of every car, and even a CD unleashing the power and glory of their engine sounds, “Passion For Speed” is the next best thing to being in the driving seat.